Gurgaon: Samsung India has concluded the second season of its campus program Samsung E.D.G.E. with participation from the country’s brightest students at leading institutions. The team from Indian Institute of Technology (IIT) Madras, ‘Athena’Z’ comprising Sudarsan MS, Saurabh Sinha and Makesh S emerged as the winner at the national finals in Gurgaon on December 01, 2017. National Institute of Design (NID), Ahmedabad came second followed by Indian Institute of Management (IIM), Lucknow. Samsung E.D.G.E witnessed an overwhelming response this year with 2,370 students (790 teams) from 19 leading campuses across the country participating in the program. 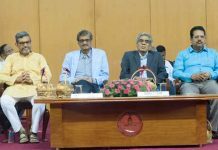 The competition, spread over three months, invited participation of students from diverse program domains such as B Tech, MBA, Masters of Design and Masters of Social Work. Ten teams which won at the zonal rounds qualified for the keenly contested national finals of the Samsung E.D.G.E. program this year. The winning team received a prize of INR 3 lakh and each member got a Galaxy Note8 smartphone while the team that came second got a prize of INR 1.5 lakh. 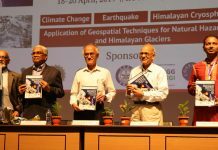 The third team received a prize of INR 75,000. Members of all 10 teams that reached the national finals received Samsung vouchers worth INR 10,000. Samsung E.D.G.E brings together bright minds from campuses across India to ideate and showcase their talents on a national platform. The platform gives students an opportunity to interact with the leadership team at Samsung, work on real-world business problems and come up with unique solutions. This year, the top 10 teams worked on ideas around Samsung’s intelligent interface Bixby, growth opportunities in smart cities, designing devices for young single-person households, online skilling and certification models and marketing. 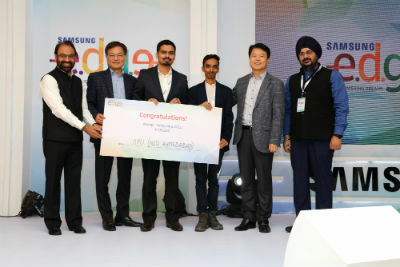 The winning team from IIT Madras impressed the jury and the audience with their idea around making Samsung’s intelligent interface Bixby better integrated with consumers’ day to day usage of smartphones. The team from NID Ahmedabad showcased a very innovative product that can make life better for young single-person households. The team from IIM Lucknow presented an idea around Bixby. “At Samsung, we always strive to encourage young minds and nurture the spirit of innovation among them. We are overjoyed by the level of enthusiasm to participate and ideation by the students at Samsung E.D.G.E. 2017. This year we engaged with students from diverse domains,” said Mr. BK Lee, Director, Human Resources, Samsung Southwest Asia. The maiden season of Samsung E.D.G.E. was also won by a team from IIT Madras. Team ‘Monimakers’ from IIT Madras had bagged the first prize for their solution on ‘Leadership Strategy in Digital Payments’. As part of their internship program, two members from the team underwent training at the Samsung R&D Institute India-Bangalore while the third member got an opportunity to work with the Samsung Pay team at the Samsung India headquarters in Gurugram. One of the interns co-authored a paper with his mentor at Samsung R&D Institute India-Bangalore and has been selected to present his idea at the Consumer Electronics Show 2018 in Las Vegas. The Samsung E.D.G.E. program consists of three rounds. In the Campus Round, team members come together, ideate and put up an executive case summary. After evaluation, the top teams in each campus are shortlisted for the Zonal Round in which all the teams closely work on the case study and present their unique solutions. At the end of the zonal rounds, top 10 teams were selected and mentored by the leadership on their respective solutions. The final 10 teams battle it out in the National Round after which the three winning teams are announced. Next articleCalm India, a web-series launched to address the declining mental risk in India!